This giveaway is now closed. Thank you so much for stopping by and entering. The winner is Adrion S (#132). Congratulations! If toting a purse, diaper bag, and cooler pack wasn’t enough, most days you’ll find a camera around my neck. My son is growing and developing so quickly and I don’t want to miss a second of it. My only way to hold on to these precious memories is through photographs. In our high-tech society, printed photographs are archaic and often end up in boxes. With all of my digital photos stored on my computer, I’ve wondered how to preserved them in a unique and creative way. What an artistic way to capture birthdays, showers, weddings, and family gatherings. And at $14.99 that’s a great deal! Now I bet you’re wondering…that’s great and all…but what about something to capture the photographs with? I’m glad you asked! According to a recent survey of 1,000 moms, 50% said they missed “priceless” photo opportunities such as childhood “first” moments. I must be one of those 50% because I am guilty of forgetting my camera at the most inopportune times. I’ve learned my lesson about leaving expensive-looking items in the car and find KODAK’s Celebration Single Use Cameras to be a savvy solution. These cameras are loaded with KODAK 800 speed film for pictures with brighter, vibrant colors. They are also outfitted with a simple, manual flash (range of 4-10 feet). For a unique look at the world from you child’s perspective, hand them one of these cameras and have them start shooting. If nothing else, it will keep them from dropping, taking apart, or trying to eat your expensive digital camera. These cameras are sold in packs of 10 and on sale now for $54.90 on the KODAK website. Be sure to check the Picture CD option when you drop the camera off for processing to get instant digital pictures. Win It! To get one of you started on your merry, memory-making way, I have a 5-pack of KODAK’s Celebration Single Use Cameras to give to one lucky reader. Leave me a comment indicating what event you’d like to use the cameras on AND what type of picture movie DVD you would create. Comments will close on August 17, 2008 at 10 pm PST and I will announce the winner here the following day. One comment per person, please. US residents only. Duplicates and comments not including the above information will be disqualified. Comments are moderated. If you don’t see your comment in a reasonable amount of time, send me an email. Bloggers and non-bloggers may enter. If you don’t want to leave your email address, please be sure to check back for my announcement on the winner. Please note that winners must respond within 48 hours of being announced/contacted or another winner will be drawn. Want an extra entry? Follow me on Twitter. One of my best friends is due to have her 2nd baby in a few more weeks. This being her first girl, I plan to put together a collection of stills and vids and give it to her as a present for her 1st bday! I hope to win! Would like to use cameras on coming visit to grandchildren and make a movie of same for family to watch when I come home. I would use this at our next family get-together to create a family Bar-b-que picture movie. This will be perfect for my mother because she’s not into digital cameras, and she loves taking pictures especially during Christmas. We have a family reunion coming up, I’d use it to make a video for all the family members of past event. Thank you so much for this giveaway. We’re throwing my parents a surprise 5oth anniversary next month and I would love to give these to a few close relatives to take photos and later, after the party, prints those photo’s up for my parents. These would be great for a upcoming wedding and a dvd of the day would be a perfect gift. I think these cameras are great for the pool or beach because you don’t worry as much about getting anything on them. I would love to make a picture DVD of my vacation. I love to take pictures-my husband bought me a fancy digital camera and I really didn’t like it-too much trouble-I much prefer Kodak single use cameras-in fact I bought several to use at my daughters wedding and the pictures came back wonderfully. What a neat product!! Thank you for offering this prize! I would use these at my sister-in-law’s baby shower! What a great idea! Thanks for the chance at a great prize. My grandchildren love to take pictures and then see what they actually did. They are so suprised sometimes on what they took a picture of! Thanks for this great contest prize! I’d use the cameras for my daughter’s 5th birthday party. I love the weird pictures little kids take! I’d use the DVD for the photos from my daughter’s adoption trip, we didn’t have a video camera so they’re all stills. 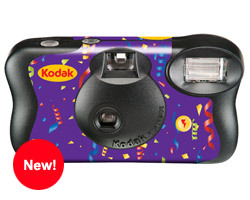 I would use this camera at my grandchildren’s birthday party on Sept.3. They will turn three and with the two of them you can never get enough pictures, so it would be great to create a dvd that I could enjoy for some time. Thank you for having this contest. I really appreciate it. I’d use it at family cookouts. Thank you for having this. I would keep a camera in my diaper bag, each vehicle and my purse. It seems like we always forget a camera whether it be at a family event or the zoo. So this would be fantastic so we dont miss those moments. My daughter’s 17th birthday is coming up and I’m sure she would love the cameras for that. It’d make a great movie. We may have a family wedding soon, this would be great to have for that. Since there’s a new baby coming soon we could use these for all the special events… in stills and DVD. My son is getting married, and I’d love to take pics and make a dvd for a keepsake. I would take pictures of the family and make a mini movie for Christmas as a gift. I think it would be fun to use in during the Christmas holidays – all the kids could have one, and snap pictures to their delight! i would put them on my daughters wedding reception tables an ask people to take pic’s of the reception an for the newly weds. I would use these at my neice’s upcoming wedding, they don’t have a big budget, and she wants everyone to take pictures! I’d love these for my upcoming anniversary. I could make a nice romantic picture movie! We’re going to Disney in a few weeks, then in Oct. we’re going to a Sixflags and indoor waterpark for my youngest’s birthday so I’d take them there!! I would use the cameras to give one to each one of my kids to take great memory shots and create a video of my daughter who is headed off to college and to her first apartment! Our family is going to Walt Disney World in the Spring for our annual Family Reunion! These cameras would be great to hand out and let everyone take photos. 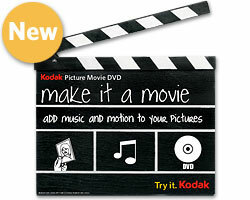 Then I can make a Picture Movie DVD for each family with all of the photos from the cameras! Thanks for the chance to win your great giveaway! I would use the camera to make a video for my niece on her birthday and I would use the cameras for halloween and her birthday. I would love to own the Kodak Cameras for my vacations. Either my daughter’s wedding or my grandson’s Bar Mitzvah. We’re having a family reunion next weekend. I think I’d let the guests randomly take pictures and then edit it together. I would use this at our next family reunion to create a family picture movie. This would be great for my aunt to chronicle family events for those of us who live far away. I’d like to keep them handy, one in my purse at all times, for those unknown moments! For guests at my daughter’s wedding. My daughter is getting married so I would love to have these for her wedding, the most special day I can give her! I would love to capture candid photo’s of my new first grandbaby. He is so cute! I want to take as many photo’s as I can so I can make a photo album for Christmas presents. So I could really use these cameras. I NEED this for my sister’s wedding this fall 🙂 I would create a wonderful set of all of her guests and of course, she and her amazing future husband..and then give as a gift to her…thanks! My cousin is having her third child in October, her first son, and it would be nice to take tons of pictures of him, and maybe his older sisters too! And make a scrapbook for her for her birthday! We are going to Disney world for the first time with my husbands family in December. I’d love to have the camera to capture all the special moments and make a video of the Disney trip/family reunion to keep the memories alive and to be able to share with other members of the family who, unfortunately, won’t be able to join us. Thanks for the giveaway! My grandsons are coming to visit and this would be so much fun for each of us to take pictures of the visit. We would all have our own pictures! My daughter is getting married aug 23, son is having his first child sept 7 and neice is getting married sept 13. So i sure could use this prize and would love my daughters wedding and new grandson on dvd. Thank you for your time, effort and energy to provide us with these contests to win great prizes. I’d love to take these to the little league party after the season is over! Family ALL comes to my house for Thanksgiving and I’d love to pass these out this year. My house is only a 2 bedroom and there’s about 50 people who come here- it’s amazing. We do it every year though. My grandson is just going to start school and wants to play soccer, it would be great to take pictures at his game, those little ones will be so much fun to watch just learning the game! Would be great for the upcoming family reunion! These would be great for an upcoming family reunion and then to be able to make them into a dvd to give as gifts for everyone later on. Memories,…memories…can never have too many happy ones. I would use the cameras around the holidays and let my children use them to take some candid shots. We are planning a family reunion/vacation and I would use the picture movie dvd at that event. What fun! Thanks for the giveaway! I would snap my family at the family reunion and make a scrap book and a dvd for everyone. I work in a Mental Health Facility and I take lots of pictures of our members at events. I always make two copies, one for the person and I for our memory book. I’d love to win, it would be put to good use! I would use these for my son’s bday party. We have a wedding coming up, these would be great for the reception! I would make a DVD of my grandson on his upcoming birthday. I would use these cameras for my church events. I would make a 3d movie about rollercoaster riders or something so the motion would be great. I would use these on our upcoming family reunion. We don’t get to see much of each other so it would be awsome to have a movie of the family for a keepsake. We have a family reunion coming up so I would use the cameras there and the make a dvd movie from them for everyone to have a keepsake of the special day. My older daughter wants a trip to New York for her sixteenth birthday, I would love to record her whole trip from take-off to landing! Christmas at my house this year with my daughters and 9 grandchildren. Oh yes their husbands too. any occassion can be a photo occasion. babyshowers, weddings, birthdays, vacations, anniversaries, graduations, reunions, are all worthy of photos. I definitely love making family movie dvds. I have my two sons and one niece and nephew birthdays coming up.. there you go I would love to make a dvd of all the birthdays parties and to see how they have grown up. I am a photo freak and would love this prize! thank you so much for the chance to win! My son’s second birthday would be a perfect occasion for this prize to be put to use!! Thanksgiving the whole family will be together and thats where I would use the camera and video. There are many events coming up to use for the camera. My parents 45th wedding anniversary would like to create a nice video, and the camera’s would either be used at that event or for the holidays. I would use these for first day of school, and let me kids each have a camera to take pictures of so we could scrapbook each childs first day of school adventures. As for the picture DVD, I would make a DVD of my best friends little one’s first year of life, this would be a wonderful unique gift for her. I would use the cameras at our upcoming wedding and would make a DVD with pics of the reception! I’d use it for my niece and nephew’s bithday. The 24th, and 27th, of this month. Thanks so much for the opportunity. One of the kids is having a birthday party very soon, these would be great to have on hand! I’d like to give a camera to each of my siblings and myself and have them take pictures. I’d put the pictures into a DVD for my mom for Christmas. We are having a 50th anniversary party for the folks soon and these would be perfect to distribute to the guests to document the event and then make a movie as a present for my parents to remember the special day. my parents are renewing their vows soon. these would be great to capture the moment. would love to be able to make a movie for them. I would take pictures of our Fall beach trip! I am leaving to live in a dorm very soon and would love these cameras to take pictures to make memories. I’m getting married in October and I would use these to let the guests take photos. That’s what I’d put on the picture DVD- wedding photos. Oh, I’d love to have it to take to the International Balloon Fiesta in Albuquerque; we go every year and take great photos! My sis is getting married in December and my kids are the only kids that are going to be there. They are old enough to use a camera like that and it would be cool to let them take their own pics of the event, how they see it. These would be great for graduations. Would give them to my daughter who has been confined to a wheelchair for many years and derives a lot of pleasure from taking picture of anything and everything and giving copies to the people associated with them. She uses disposable cameras almost exclusively. I would give these to my extended family to capture memories for when my husband and I come off the plane from getting our adopted baby girl from China! I just moved to Arizona. I would love to do a movie of the area. The rock formations are fabulous. I’m going to NYC next month. I would make a video documentary of the trip. I would use them on the girl’s weekend my friends and I am having on the Jersey Shore. We have a family reunion on the horizon. I’m taking my nieces camping for one’s 13 birthday. With all the different ages, we want to memorialize different things. With all our memories on this camera, I’ll make the hippest movie they have so my nieces think I’m cool. I want to use this to document my son leaving for college and moving into the dorm. It doesn’t qualify as a celebration for me but it might for him. I’d like to make a movie that shows his growth from baby to manhood. I’ll probably cry while I make it though. I’d use these at my parent’s upcoming 50th anniversary. I’d create a movie using the new pictures and combine it with older pictures to make a montage of their years together. My son’s birthday is in Dec. One of his presents is a trip to Hershey, PA at Christmastime and another is a trip to New York City to see the Christmas Spectacular at Radio City Music Hall. He’s also starting junior high school this year, so I’m sure we can find many uses for the cameras. I would take the most memorable moments from this school year and put them together for his birthday present next year. Thank you for the contest! I’d use them for our family ski trip to Vail this December! any family event as well as daily life of my toddler, thanks. I would use these cameras to take pictures of my one year old who is always doing something new and cute. I also have a baby on the way, so these would be great to take to the hospital to capture the first few days of life! These would be great for our family reunion this fall. I would create a DVD of all the festivities! I would love to have these for my son’s wedding. Thanks for the chance to win. My next family get together like a baseball game or soccer game would be great. My nephew graduates after this year. I’d let him take pictures throughout his senior year and create a movie DVD for him and his friends as a small graduation gift. I would use the cameras at my daughter’s upcoming birthday party. I would use the cameras for activities with my family and nature. i just took a photography class and learned all sorts of techniques that i would use! a video i would put together would actually be a slideshow with intermittent comments from my family and friends! i love taking these to theme parks cuz it’s not a big deal if you lose it! i could make a dvd movie of all our trips to theme parks, that would be fun! My son is going to Disneyworld with his aunt and uncle and this would perfect to see what his trip is like. October 2009 wedding memories in London.My son and future sweetie daughter-in-law can use these for their guests to snap photos for their wedding memories! Once I saw a mini-documentary on Current about a band who had the audience members shoot cell-phone videos of their concert and then they compiled all the footage into a music video that shows the concert from different point of view. I’d take a page from their book. Meaning I’d hand out the Kodak cameras to several people at my daughter’s 10th birthday party, and make a DVD montage that incorporates photos of that day from different points of view ,including my daughter’s. And I might actually get to be in some of the pictures. I’m absent from most of the photos of my little girl’s life because I was always behind the camera documenting everything. I would love to win so I can use it at Christmas time when The grandkids opened their gifts. I would use these when I visit my father this fall and create a movie of the special moments that me and my dad will surely have. I’d give this to my daughter, who has expressed interest in photography. This would be a great start. For my “movie” I’d use ictures from our vacation in Hawaii. My daughter’s 16th birthday is coming up and I would love to do slideshow of her past 15 years. I would use these on our upcoming family reunion. We haven’t been together since 2003. I would actually like to have a premade DVD to play at the reunion using our favorite family photos from the past (several have since passed away) and then use the cameras at the reunion to make a DVD of the families today. Thank you for the opportunity to win! We can’t change the past so I want to make new memories. My daughter-in-law will have a baby soon so this would be a good time to start taking pictures. I would like to make a DVD that will highlight my daughter’s swimming accomplishments. I would like to take pictures at our family reunion, and I would like to make a DVD of that. these are great to take to the beach! i’d love to make a dvd of our trips to the beach this summer! This would be great for my students to take pictures of their contests this year and for them to do a slideshow at the end of the year! I would love to take pictures of my work trips out of the country and then put them into a movie to bring back and present to my coworkers. I want to use these to give to the kids for special events and field trips. I would use this camera for vacation photos and create a slideshow DVD of these photos.